WebM is an open media file format designed for the web, encoded with V8/V9 video codecs and Vorbis/Opus audio codecs. It is wildly used in YouTube, Wikimedia, Skype, 4chan and many more sites. 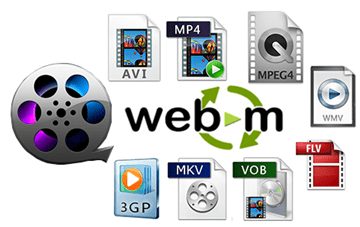 Thus a WebM converter is essential to convert videos to WebM or vice versa so as to be compatible to common video sites. You can surely use free WebM video converter like AVConv or FFmpeg to covert videos to WebM. But unfortunately something get wrong with the MP4 to WebM converters these times. As I know, the WebM video quality converted by AVConv is likely rubbish hence the use of few flag on audio video and transcoding. Worse more FFmpeg is not available for MP4 to WebM conversion right now. So the advanced method is to fall back on another efficient WebM converter for Mac such as MacX Video Converter Pro. As one of the best WebM converter, it could freely convert any video to WebM as well as WebM to MP4, MOV, AVI, MKV, FLV formats fast yet with great quality. On basis of the comparison of WebM and MP4, we know that WebM is built for the Internet streaming instead of easily website video uploading, moving and copying as MP4. But the HTML5 video converter, MacX Video Converter Pro. could realize the conversion from format to format, enabling you to convert MP4, AVI, MKV to WebM for a better compatibility of web pages, and WebM to any formats supported by iPhone iPad Android devices. Step 1: Free download this WebM converter for Mac, install and launch it. Then import the desired video in the queue of converting to WebM by clicking "Add Files". Step 2: Click "General Profiles" > "WebM Video" to select the output format for your video. 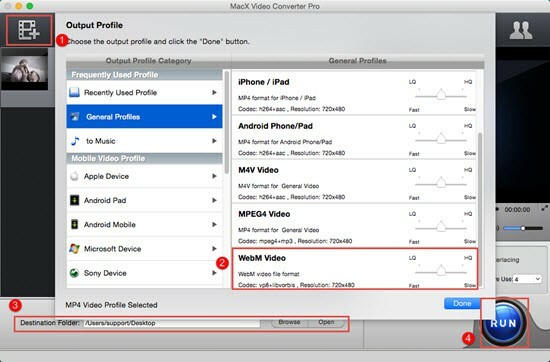 By the way, if you wanna to convert WebM video to MP4, AVI, MOV, MKV, FLV etc, you can choose the corresponding format here, or even the preset device profiles for your iPhone XS/XR/X/8/7/6s/6s plus, iPad Pro, Samsung Galaxy Note 5 etc. Step 3: Choose the destination folder by clicking "Browse" button. Step 4: Hit "RUN" icon to start converting video to webm or WebM to MP4. A key factor in the web's success is that its core technologies such as HTML, HTTP, and TCP/IP are open and freely implementable. WebM was built for the web. By testing hundreds of thousands of videos with widely varying characteristics, we found that VP8 and VP9 deliver high-quality video while efficiently adapting to varying processing and bandwidth conditions across a broad range of devices. High-efficiency bandwidth usage and reduced storage requirements can help publishers recognize immediate cost savings. And it requires comparatively little manual tuning in the encoder to produce high-quality results. Thus converting video to WebM is the coming trends for web pages, the popularity of WebM video converter is also market demand meanwhile. Why Create A New File Type (.webm)? Why Not Use .mkv? Since WebM is a subset of MKV, it has fewer allowed stream types and features than MKV. A distinct name gives us a way to easily refer to the subset, and gives users a way to associate a piece of content with a client having known-good support. Google Chrome, for example, may or may not be able to decode filename.mkv, but it will absolutely play filename.webm. Thus if you have an MKV video, you can make use of a Webm converter or MKV video converter to convert it to MKV for wilder use.